Acupuncture belongs to Chinese Medicine. Other therapies like diets, massage (Tuina), the use of herbs, Tai Chi, Qi Gong etc. are also parts of Chinese Medicine. All these therapies share the same denominator: they don’t have the unique goal to cure diseases but to discover patterns of disturbance in time and prevent possible complaints and illnesses. 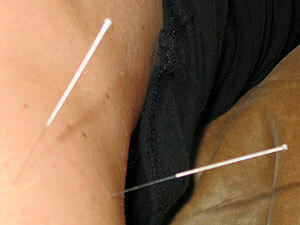 In acupuncture fine needles are put into precisely defined points on the body. They will stay in for 20 minutes. It depends on the diagnosis which points are chosen during the treatment. Quite some time is therefore spent on the diagnosis during the first appointment. There are functional relationships between different acupuncture points. Because of this it is possible to stimulate the body in different ways. A healthy body continuously corrects and restores the homeostasis, the balance of all functions of the body. This allows the body to adjust to all the changes. You can talk of homeostasis when the functions and processes of the body, psyche and mind are in balance with the internal and external circumstances and changes. Through the use of acupuncture we try to correct a dysfunction of the homeostasis by freeing the passage of energy in the meridian. Body, psyche and mind are treated at the same time. The different points used in the treatment show the body the way it has to work to correct the disturbance. Besides needles, acupuncture also works with moxa. Moxa is a dried herb, artemisia vulgaris, which can be used in several ways.